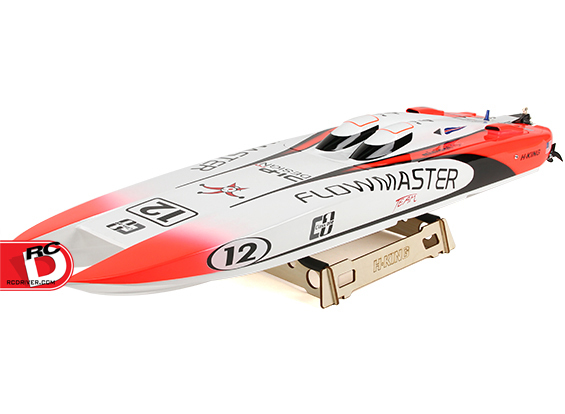 The HobbyKing C1 Flowmaster Twin Catamaran arrives Almost Ready-to-Run (ARR), needing just a 2-channel surface transmitter and receiver, along with two 3S 11.1V 3000~4000mAh lipoly battery to get it going. The Class 1 offshore racing style hull has been skillfully produced with hand laid fiberglass and then expertly finished with colorful graphics that are then clear coated to a high gloss finish. What sets the C1 Flowmaster Twin Cat apart from other ARR boats is not just the quality of the final finish, but the sharply molded hull lines. 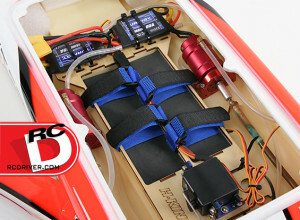 This increases precision and tracking, important in the world of boat racing. Powering the C1 Flowmaster Twin Cat are two 2860 3300kv watercooled inrunner brushless motors mated to fully adjustable, CNC ball bearing supported outdrives. The driveline angle can be adjusted to suit different conditions, whether you want to run wet, or on the ragged edge of nose high. Access your motor and battery through a magnetically secured hatch. 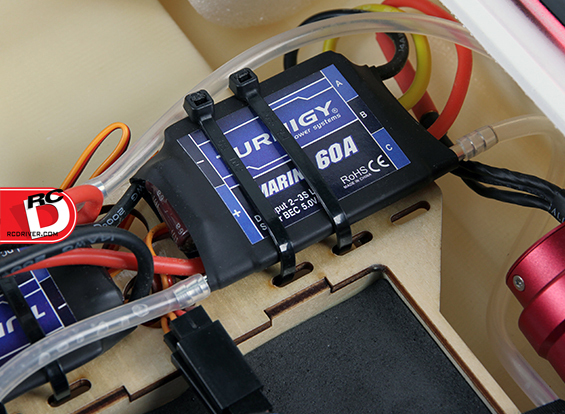 A laser cut plywood battery tray also serves as the ESC, receiver, and servo mount. Included in the box is a laser cut plywood display stand, spare propeller, balloon for waterproofing your receiver, and a roll of waterproof hatch tape for double security on that battery hatch.